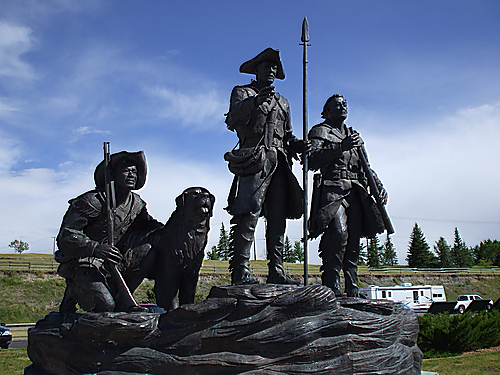 To conclude our tour through the Lewis & Clark Expedition in public art, let’s take a look at the sculptures of Meriwether Lewis and William Clark that adorn the trail from the Rocky Mountains to the sea. As with earlier installments, please let us know if we missed any. 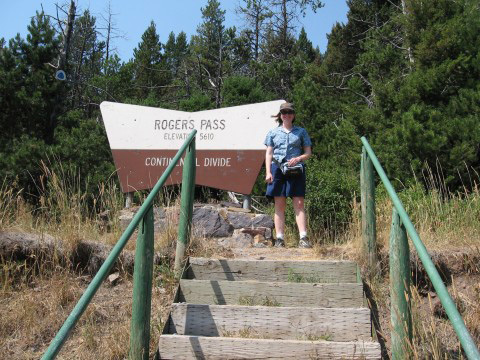 This is a part of the trail we have traveled very lightly and I am dying to go back. 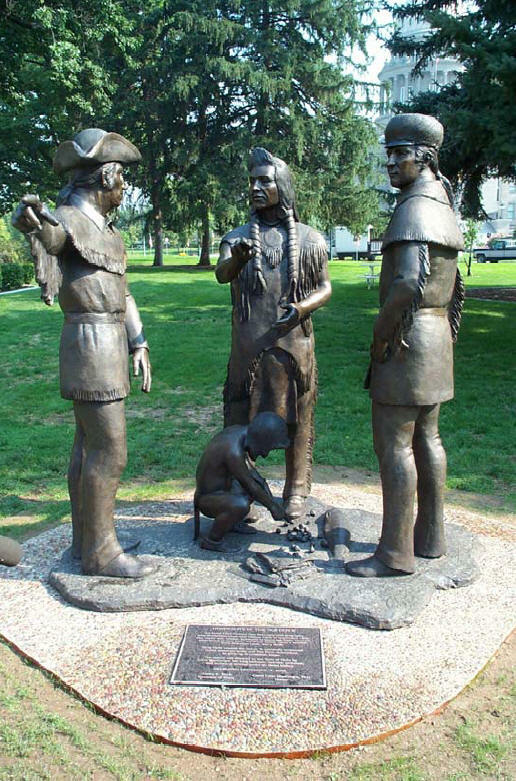 This beautiful bronze by Doug Hyde, a Santa Fe-based sculptor of Native American descent, was commissioned for the centennial of Lewis-Clark State College in Lewiston, a pretty town at the confluence of the Snake River and the Clearwater River. 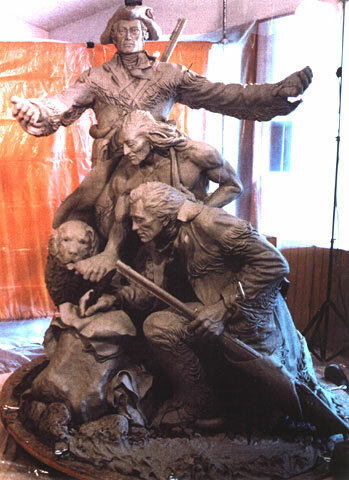 It depicts Lewis and Clark meeting with Twisted Hair of the Nez Perce as his young son Lawyer, later to play a major role in the conflict between the Nez Perce and American settlers, plays at their feet. Look familiar? If not, consult your doctor about short-term memory loss. 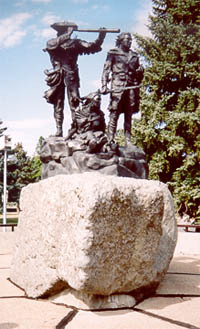 In 2006, historian Carol MacGregor commissioned a replica of Hyde’s Lewiston statue to be placed on the campus of the Idaho state capitol in Boise. 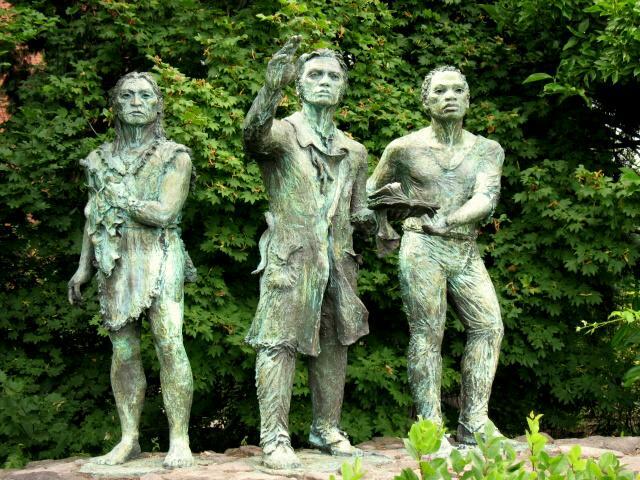 I have not been able to discover much about this statue and would love to hear any further information about it. 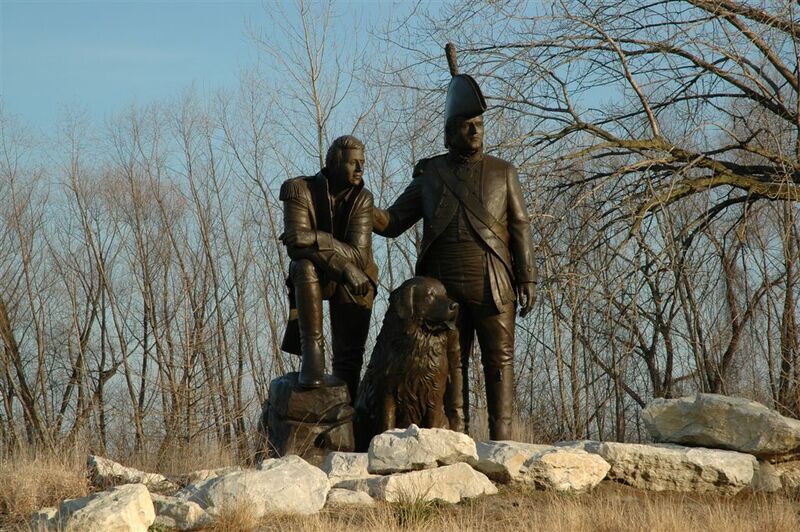 Talk about a terrific old statue! 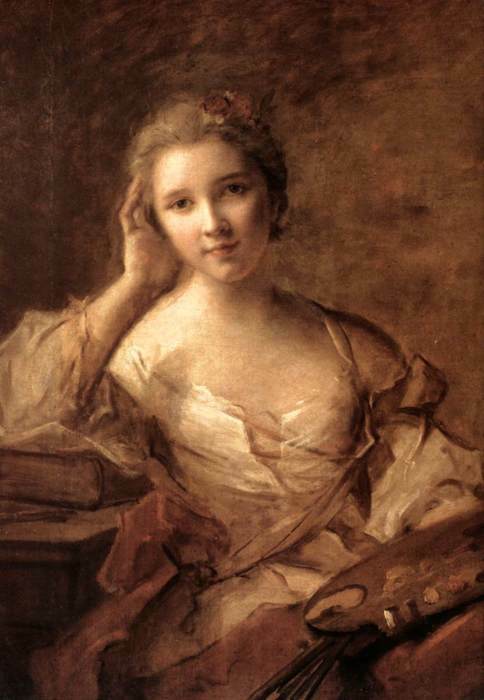 This is another one about which I have been able to learn next to nothing. 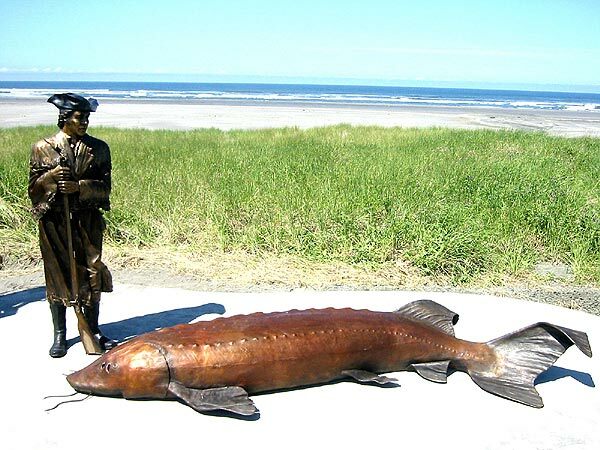 I am not even sure of its exact location, but it appears to be in the Cape Disappointment area, where Meriwether Lewis explored before he and Clark settled the Corps of Discovery at Fort Clatsop near Astoria in the winter of 1805-06. 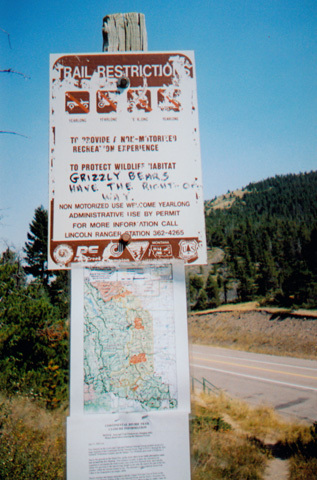 Please post in the comments if you know anything about this gem. 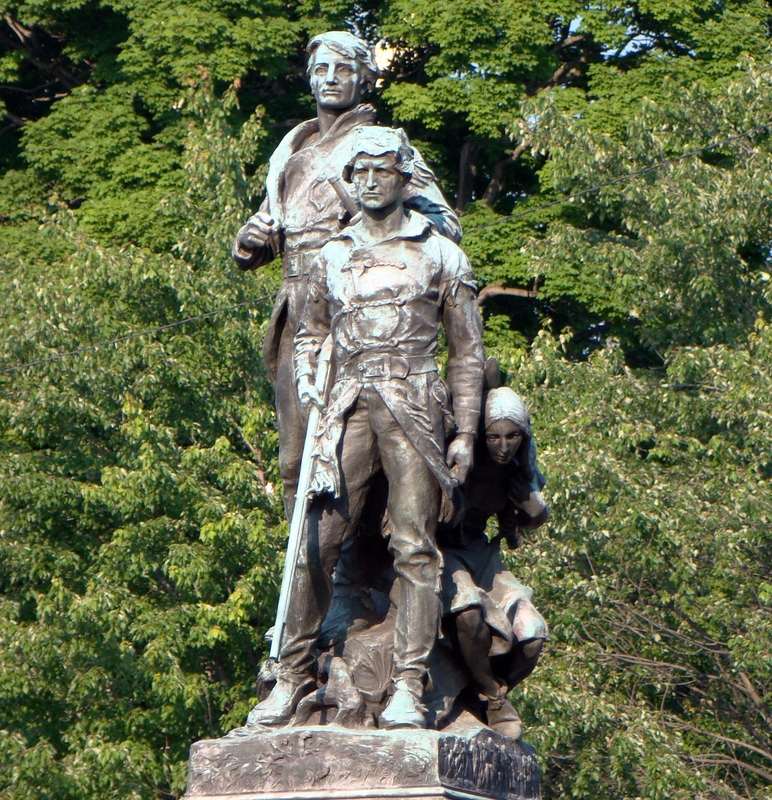 Lewis and Clark monument by Stanley Wanlass (1980). 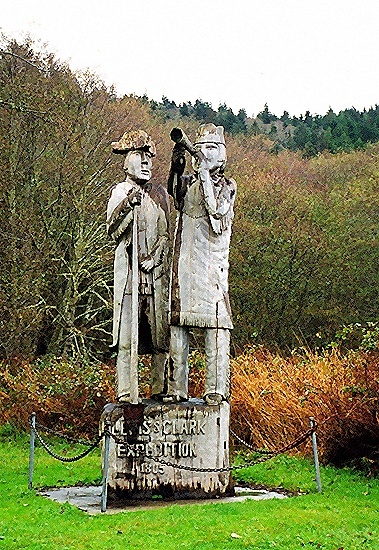 This statue stands inside the Visitors' Center at Fort Clatsop near Astoria, Oregon. 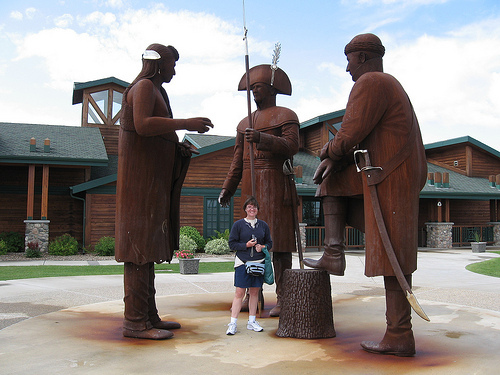 For the most part I have skipped some indoor statuary for this series of blog posts, but Stanley Wanlass’s bronze is the show-stopper at the Fort Clatsop Visitors’ Center. It is indoors due to the extreme rainfall in the area, which is so much a part of the Lewis & Clark story at Fort Clatsop. 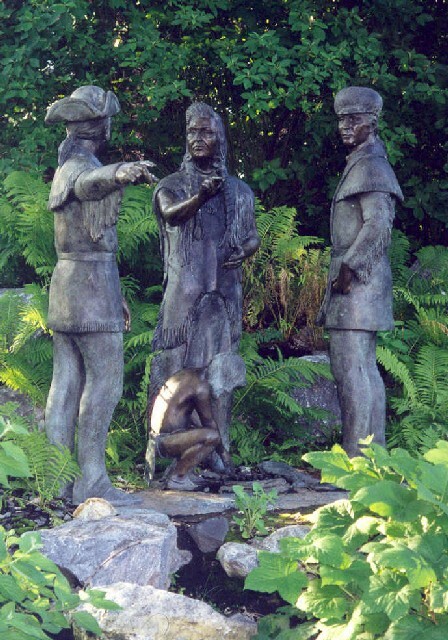 Clark and Seaman take a look at a fish being offered by a Native American, while Lewis, the gourmet of the group, is busy being visionary. 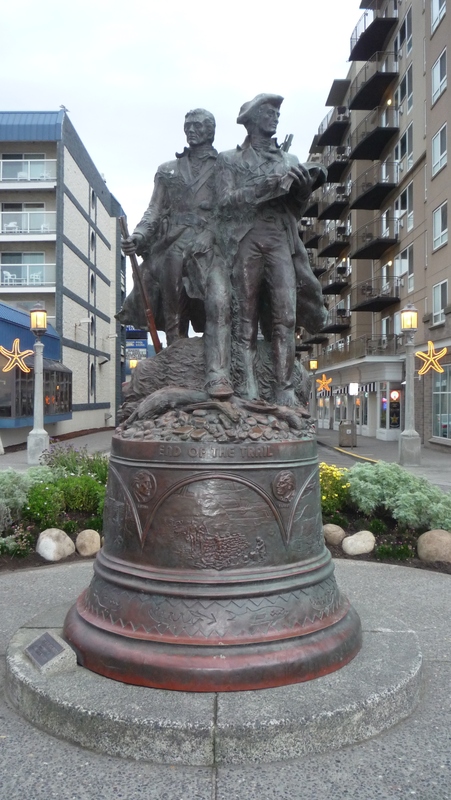 This beautiful bronze by Stanley Wanlass marks the official end of the Lewis & Clark trail, the westernmost point reached by the intrepid pair. For more about Wanlass, check out his very interesting website, which includes photos of his fascinating automotive sculptures. 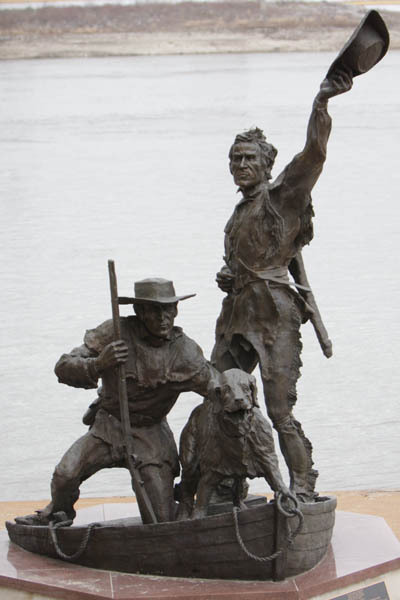 Again, please leave information in the comments about other Lewis and Clark sculptures or further information about these fascinating memorials to the leaders of the Corps of Discovery. 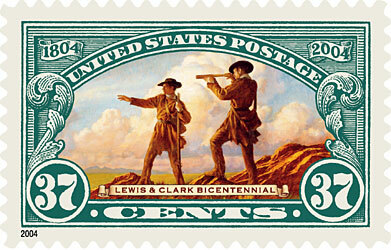 The Lewis and Clark expedition is somewhat underrepresented in U.S. philately. The expedition has been the subject of U.S. stamps twice. 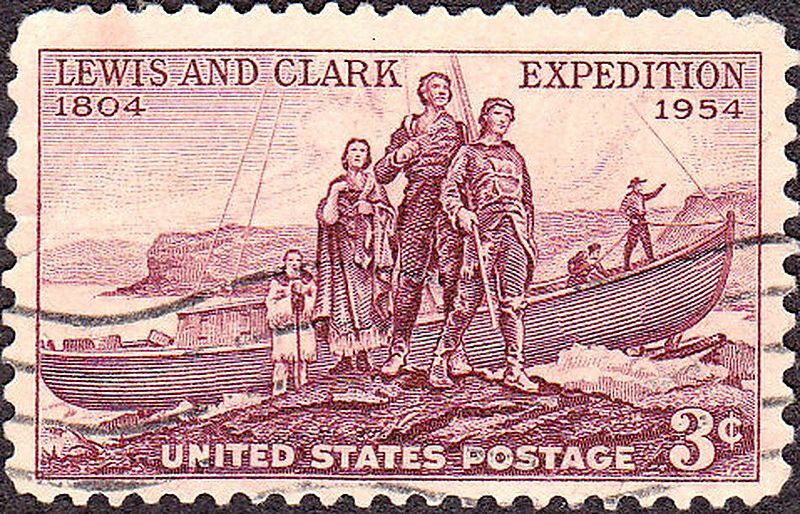 In February 1954, the sesquicentennial year of the expedition’s departure, Congressman Charles Hoeven of Iowa introduced a bill authorizing a Lewis and Clark commemorative stamp. 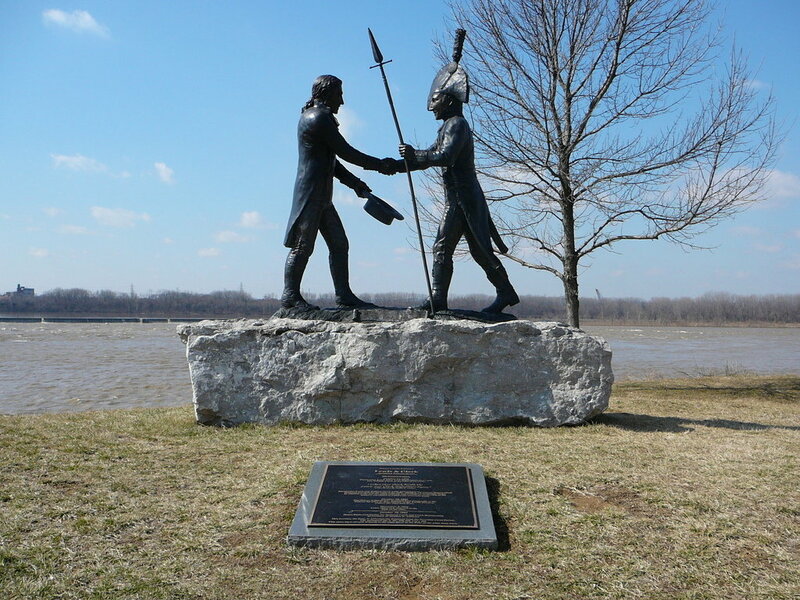 Although the bill never got out of committee, it did vault Lewis & Clark to the top of the list of subjects under consideration. 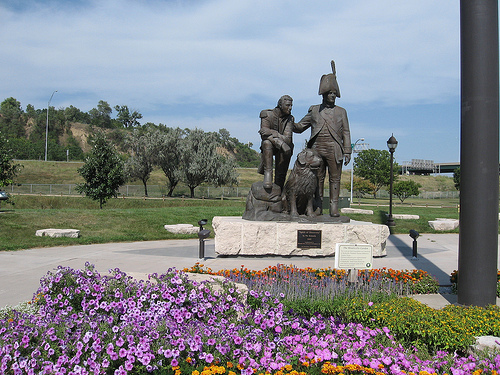 In June 1954, Postmaster General Arthur Summerfield announced that a Lewis and Clark stamp would be issued on July 28 at Sioux City, Iowa, which happened to be in Hoeven’s district. 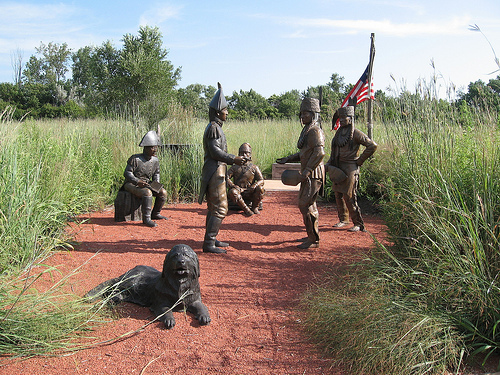 When other cities along the trail protested the choice of location, the postmaster justified his choice by stating, “Sergeant Charles Floyd, a member of the Expedition, died and was buried” at Sioux City. 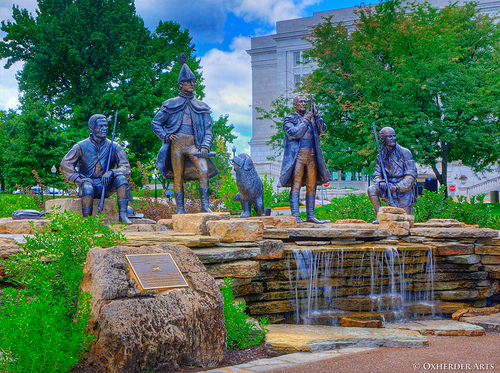 However, Floyd is not believed to be pictured on the stamp, which includes Lewis, Clark, Sacagawea, and three unidentified members of the Corps of Discovery. The image on the 3-cent stamp was designed by Charles R. Chickering, a book and magazine illustrator who worked as a designer at the Bureau of Printing and Engraving from 1947 to 1962. 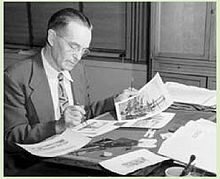 Known as the “dean of American stamp designers,” Chickering is credited with the sole design of 66 U.S. stamps and joint credit for the design of 11 others during his 15-year career at the BPD. 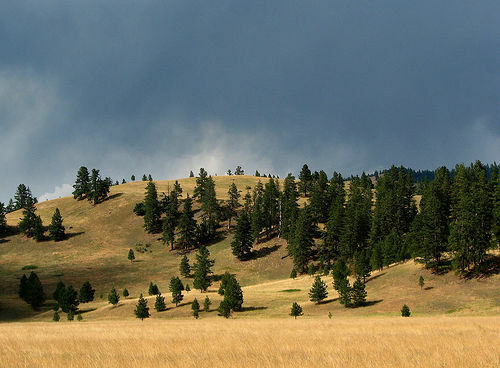 Bernard DeVoto, famed historian of the American West and an expert on the Lewis and Clark Expedition, was a consultant in the design. 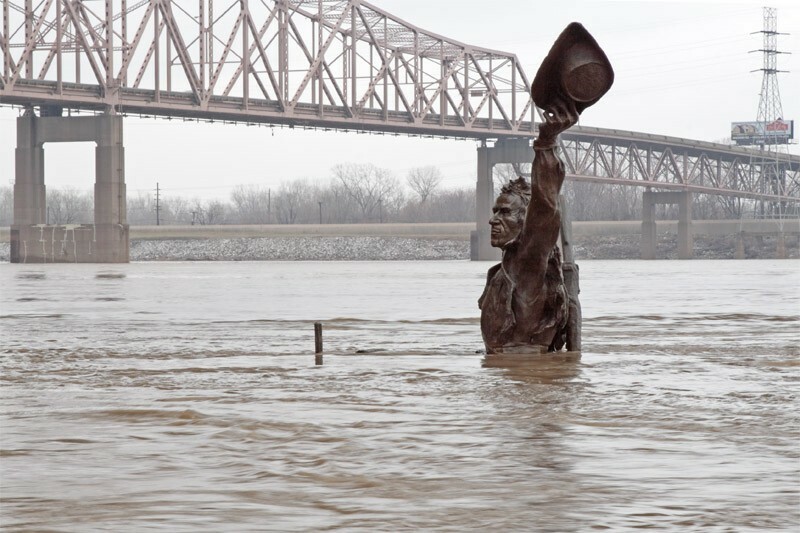 Fast-forward fifty years to the next Lewis and Clark stamp issue. 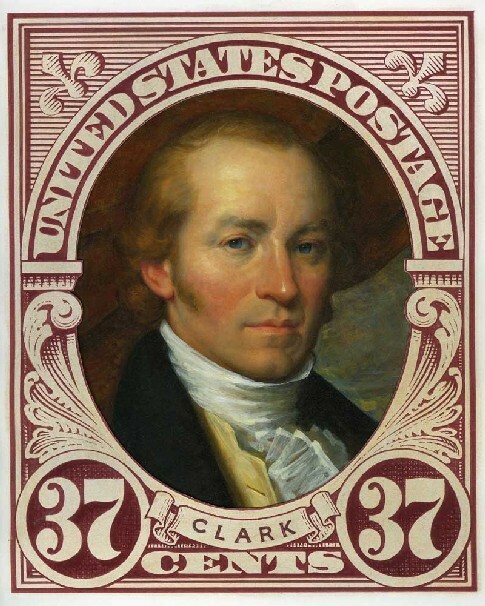 To commemorate the bicentennial of the official launch of the Lewis and Clark expedition, the postal service issued a set of three 37-cent stamps on May 14, 2004. 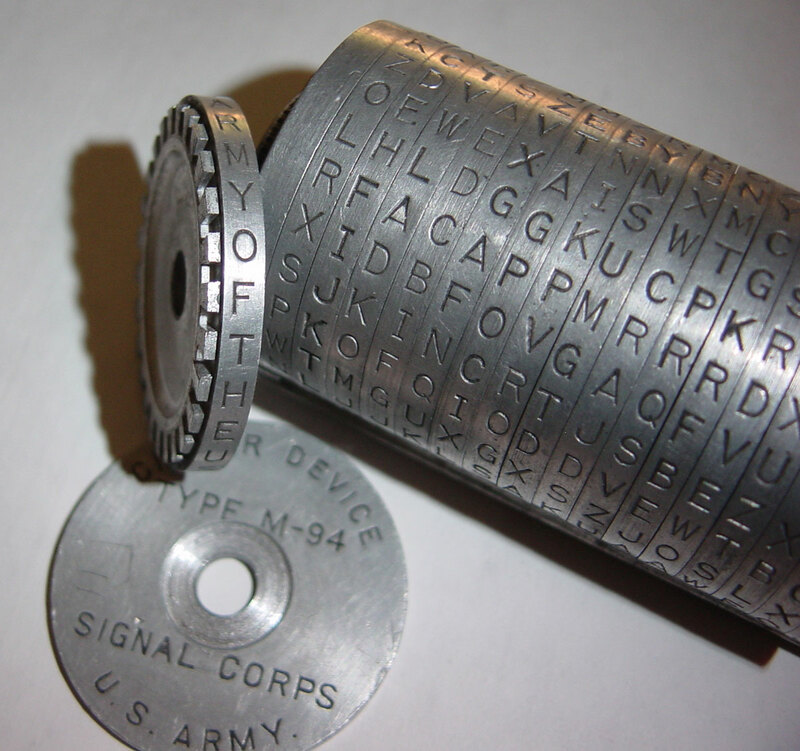 Perhaps to make up for the Floyd imbroglio, the stamps were released simultaneously in the following cities: Astoria, Oregon; Atchison, Kansas; Great Falls, Montana; Hartford, Illinois; Ilwaco, Washington; Orofino, Idaho; Omaha, Nebraska; Pierre, South Dakota; Sioux City, Iowa; St. Charles, Missouri; and Washburn, North Dakota. 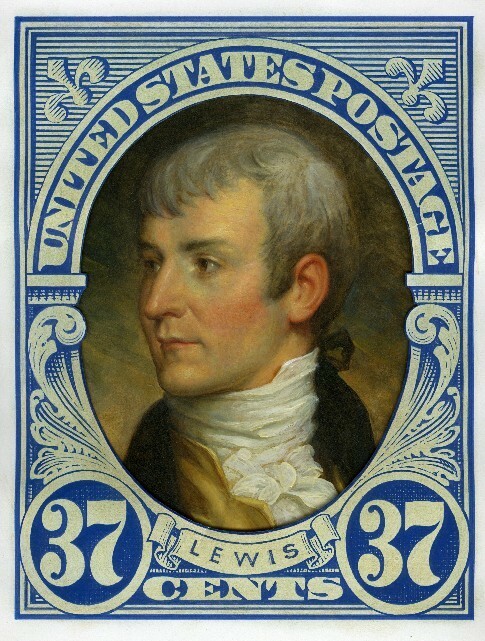 The stamp set featured individual portraits of Meriwether Lewis and William Clark, painted by Michael J. Deas in a style reminiscent of the Peale portraits, with a dash of smoldering romance-novel cover art thrown in. Deas is an experienced stamp designer whose other subjects include movie stars, politicians, and literary figures. 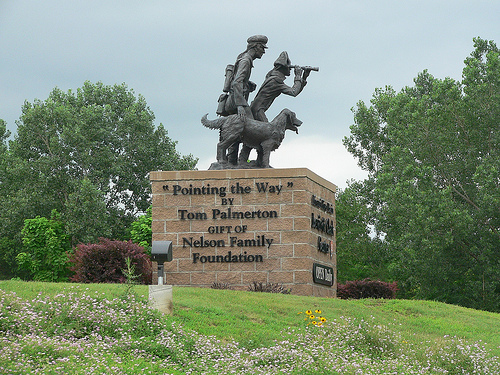 In addition to the portrait stamps, Deas also designed a commemorative stamp of Lewis and Clark standing on a promontory surveying the countryside. The stamps were also issued in a 32-page prestige booklet that included text and illustrations, and the commemorative was also produced for sale in panes of 20. 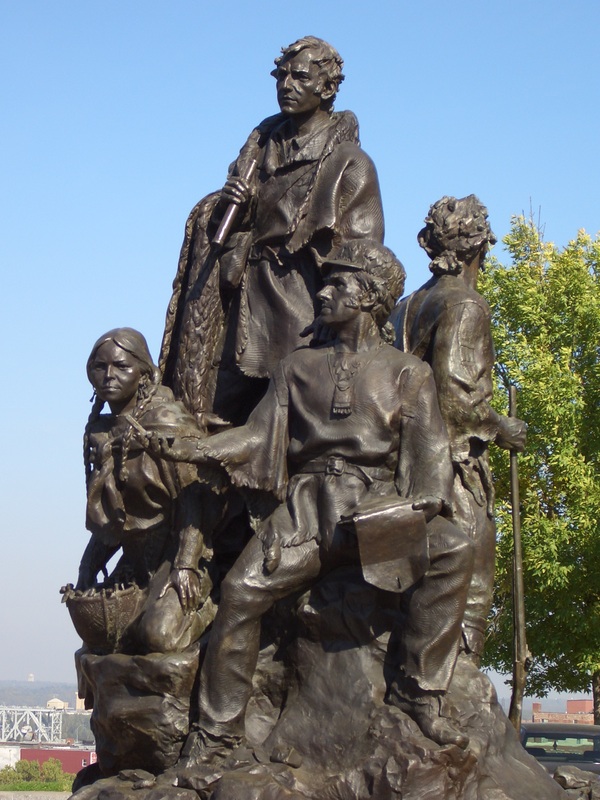 Although Sacagawea was not included on the 2004 stamp, she was pictured as the sole subject on a stamp of her own in 1994 in the “Legends of the West” series. 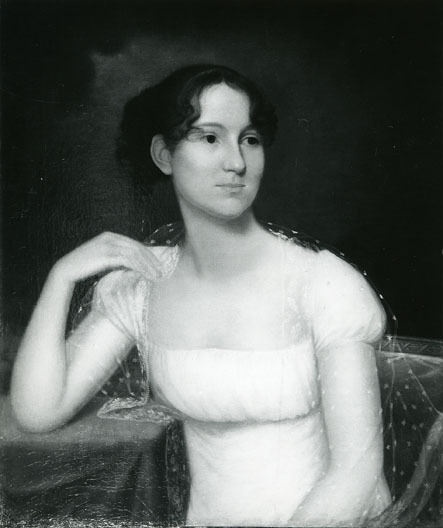 Unfortunately, this series proved to have one of the most infamous and embarrassing mistakes in U.S. postal history. 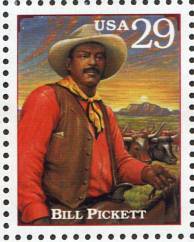 The original Legends of the West pane of twenty 29-cent stamps featured a stamp of African-American rodeo performer Bill Pickett. 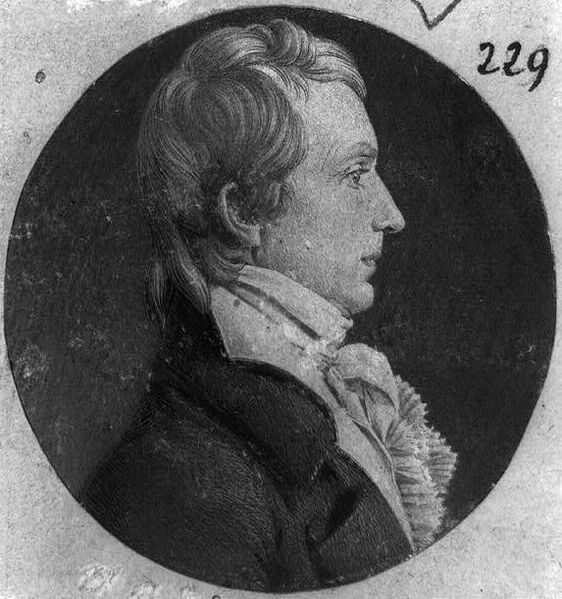 However, after over five million panes had been printed, it was discovered that the stamp depicting Pickett actually pictured his younger brother Ben. 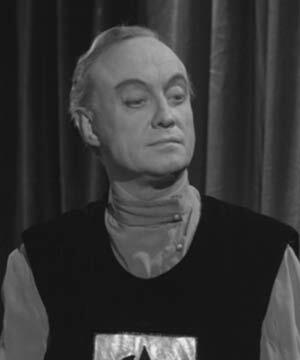 When the error was confirmed, the USPS decided to destroy all the Legend panes and to print a new set with an authentic portrait of Bill Pickett. However, almost 200 of the panes had already been distributed and sold. 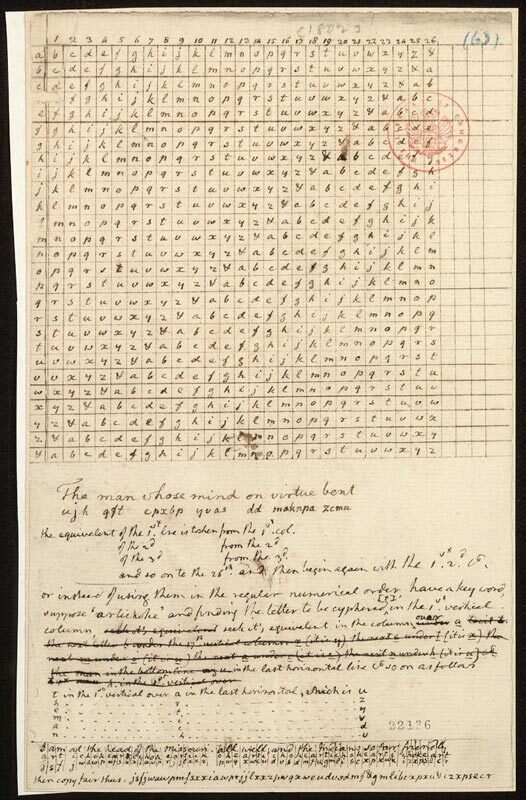 A modern philatelic rarity, the error panes quickly shot up in value, and one of them reached a price of $4,620 in a public auction. Stamp collectors clamored for the rest of the error panes to be released for sale, but the postal service had promised the Pickett family that they would be destroyed – at considerable cost. 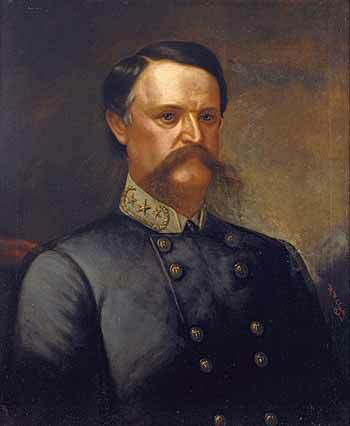 Finally, the Postal Service compromised by selling 150,000 original panes for collectors, containing the erroneous portrait of Bill Pickett. 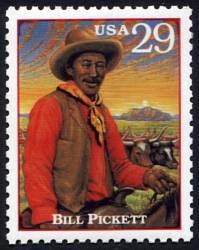 All of the remaining original panes were destroyed, and the series was reissued in a new pane featuring the right Bill Pickett. 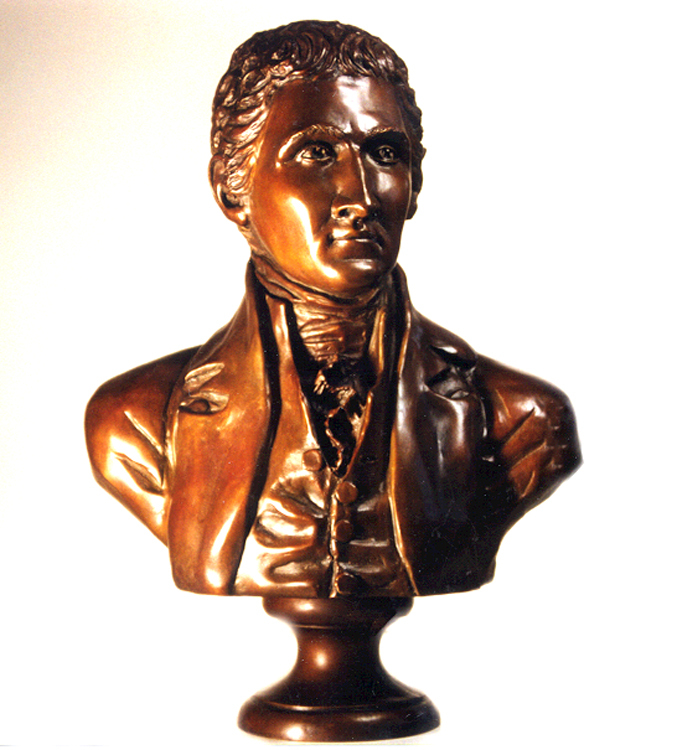 Recently, a 12-year-old boy named Jackson Davis V has been running a well-publicized campaign to put the face of York, William Clark’s slave who accompanied him on the expedition, on a postage stamp. The great-grandson of a DC postal worker, Jackson wrote a letter and sent an essay to USPS Citizens’ Stamp Advisory Committee asking that they consider honoring York with a Black Heritage Stamp. The USPS responded saying that his proposal is “under consideration.” This is a fantastic effort and long overdue. Fingers crossed that Jackson’s tireless efforts will make his dream come true!